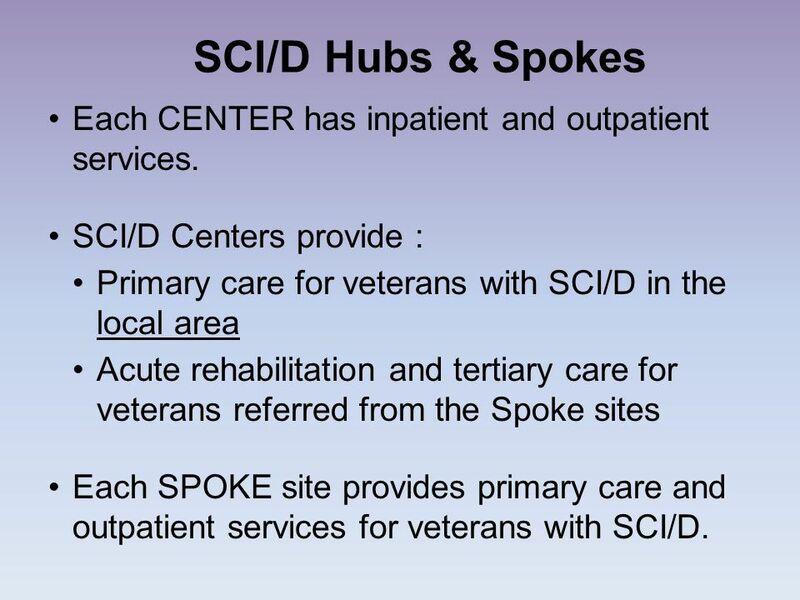 5 SCI/D Hubs & Spokes Each CENTER has inpatient and outpatient services. 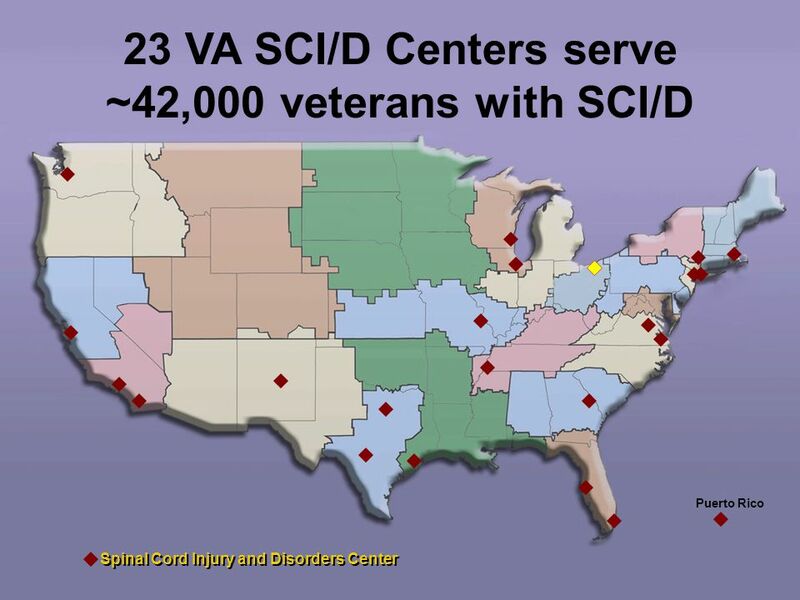 SCI/D Centers provide : Primary care for veterans with SCI/D in the local area Acute rehabilitation and tertiary care for veterans referred from the Spoke sites Each SPOKE site provides primary care and outpatient services for veterans with SCI/D. 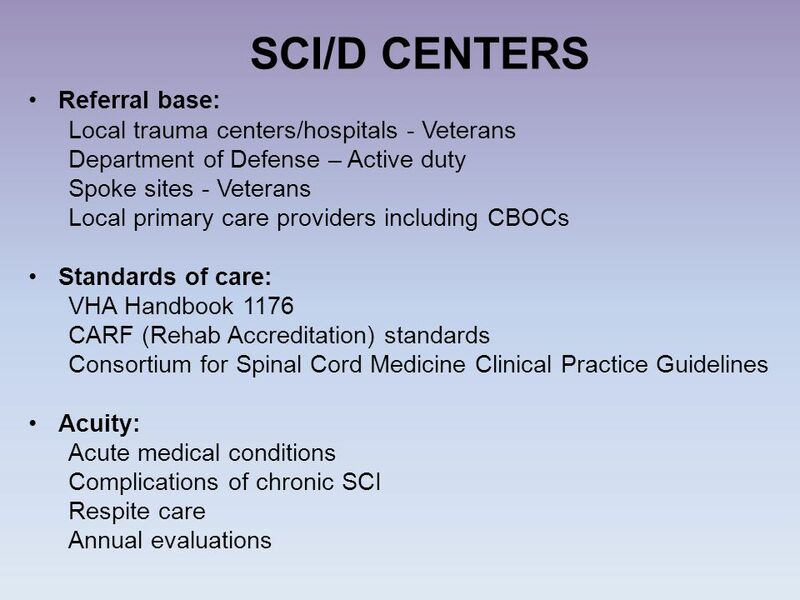 When admitting an SCI pt through Urgent Care/ED after hours, page the SCI Attending on call if questions. 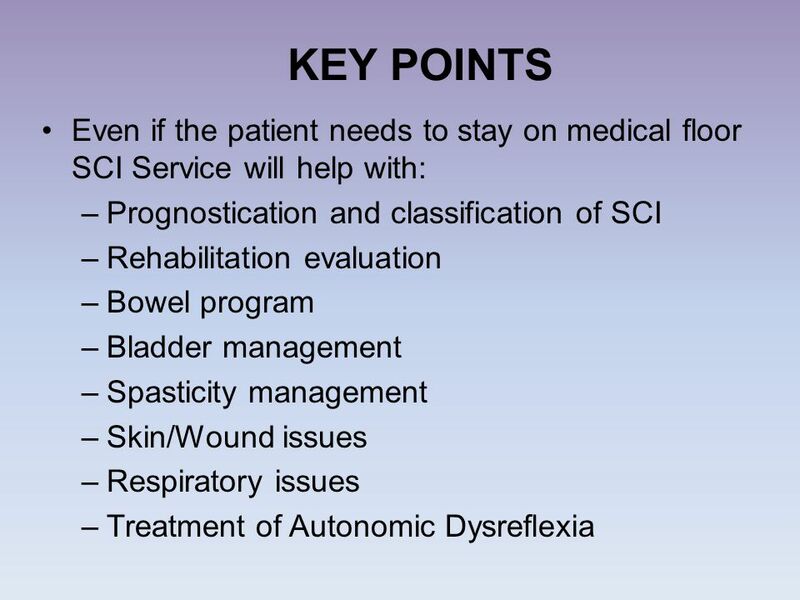 Pts are admitted to Medicine Service overnights and transferred to SCI Service the next day, IF appropriate from medical acuity standpoint. 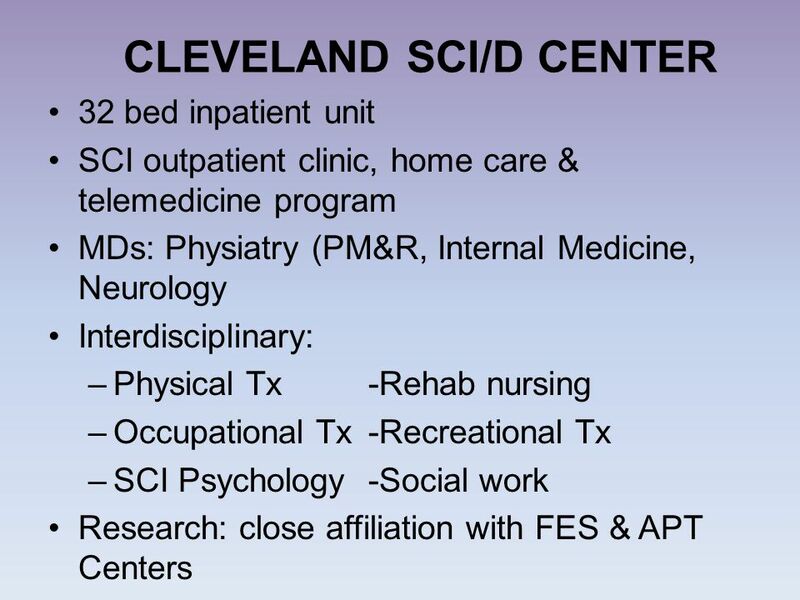 Difference between admission to WSCI (6B floor for SCI nursing care) vs. SCI Service (physician management on WSCI). 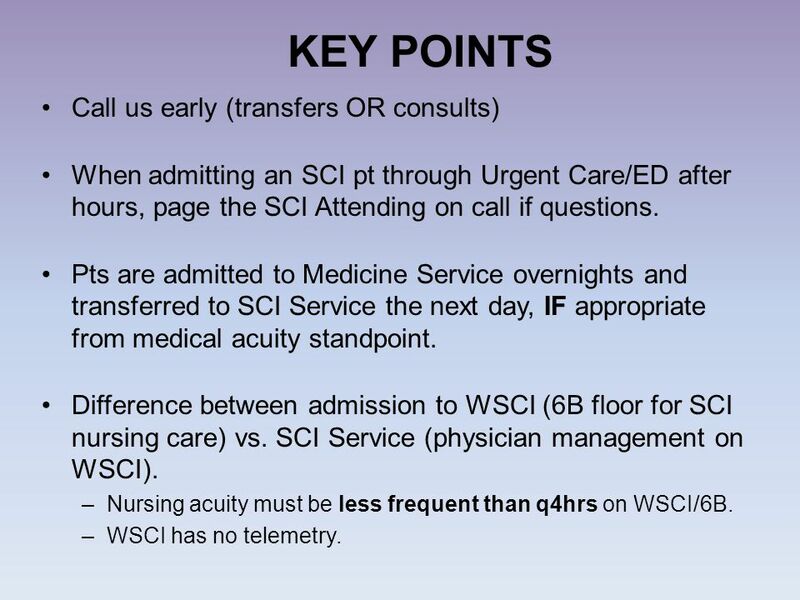 Nursing acuity must be less frequent than q4hrs on WSCI/6B. WSCI has no telemetry. 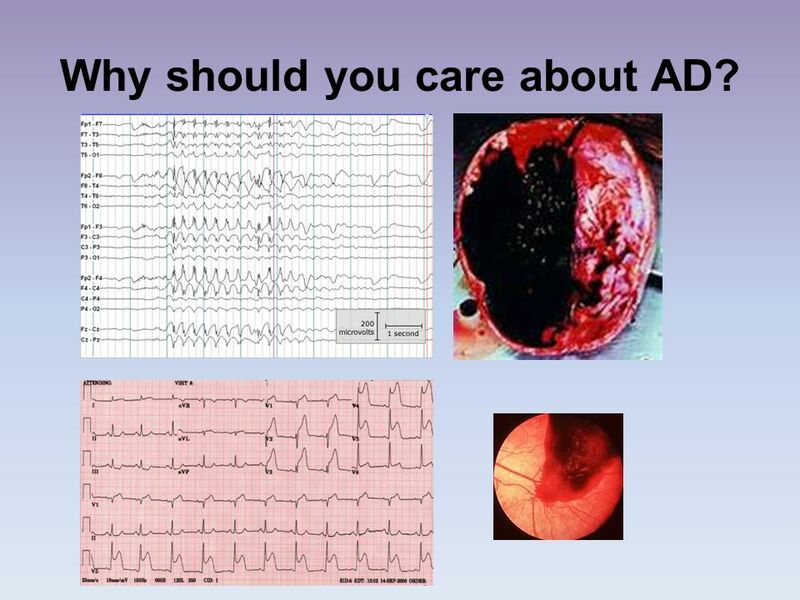 13 Why should you care about AD? 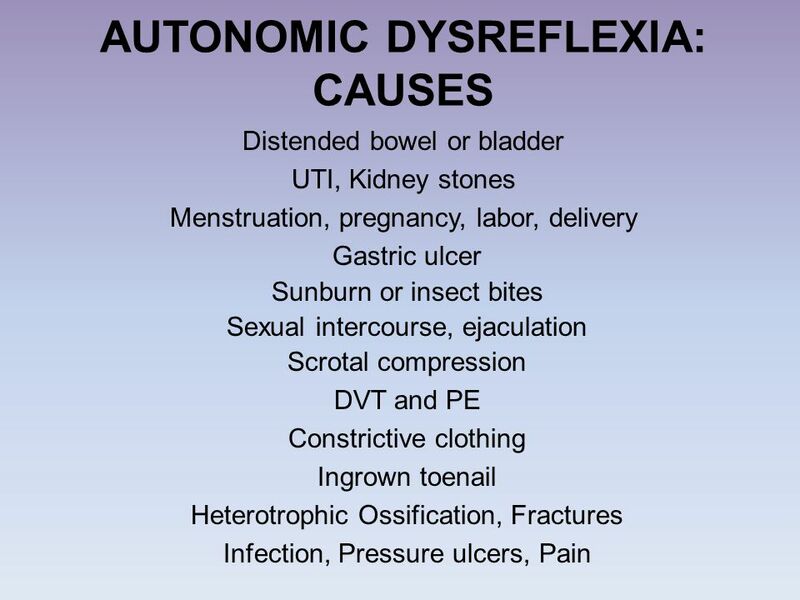 22 TREATMENT OF AD To stop AD you have to identify and remove the cause! We have a protocol for that! 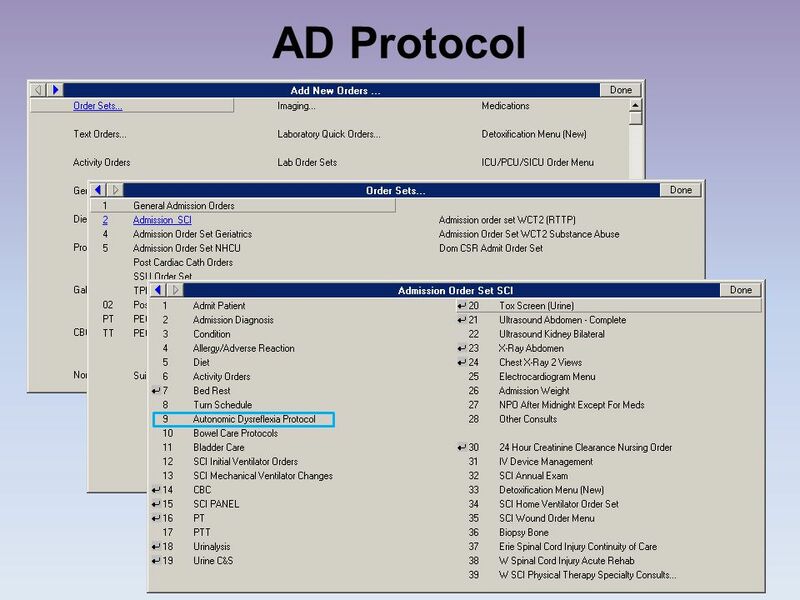 To order the AD protocol for an at risk patient with SCI go to the SCI Admission Order Set. 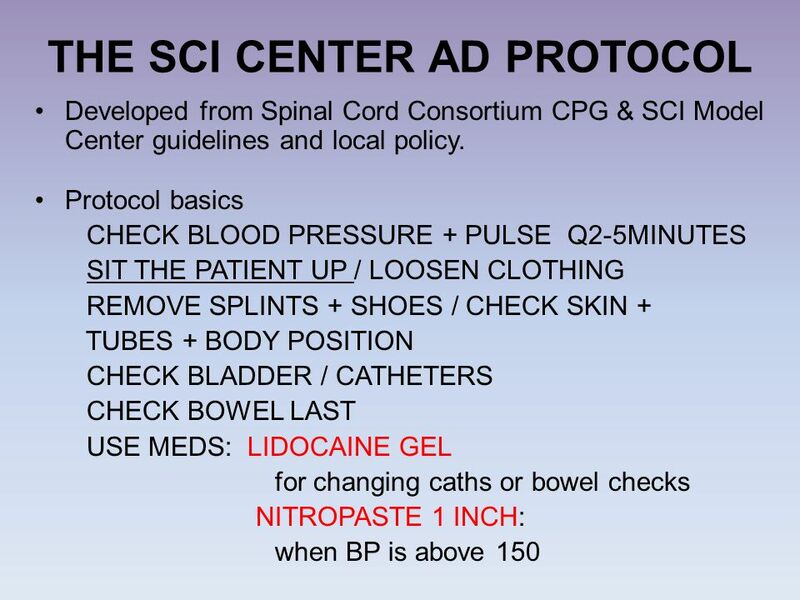 With a few clicks you will allow the SCI nurses to start the protocol and safely search for the cause of AD using meds such as lidocaine gel and nitroglycerine ointment. 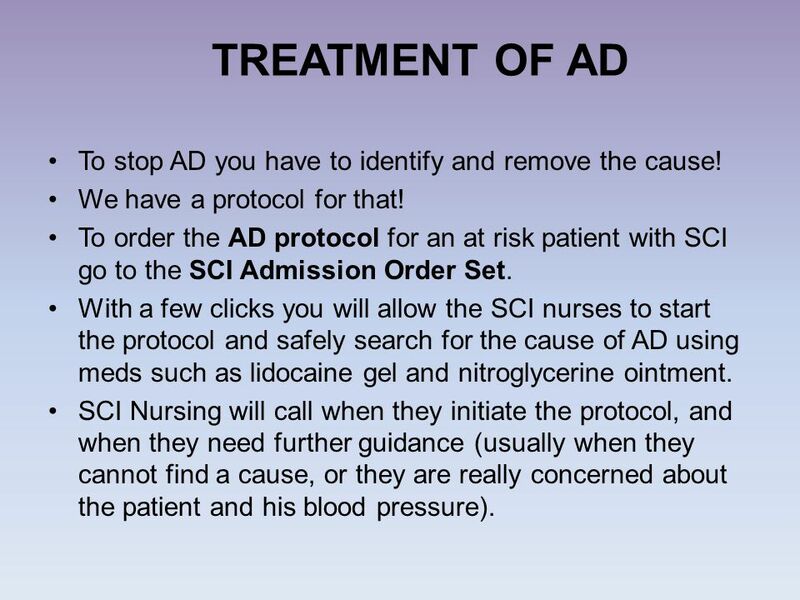 SCI Nursing will call when they initiate the protocol, and when they need further guidance (usually when they cannot find a cause, or they are really concerned about the patient and his blood pressure). 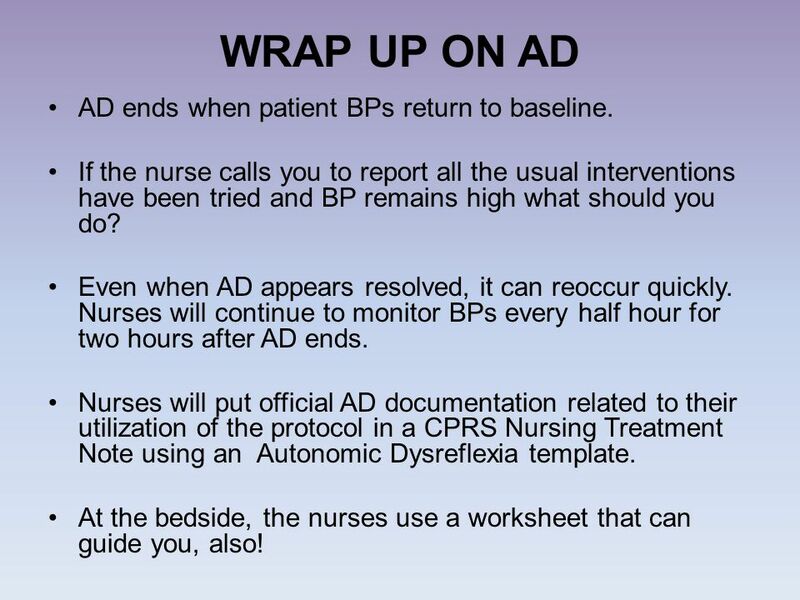 29 WRAP UP ON AD AD ends when patient BPs return to baseline. 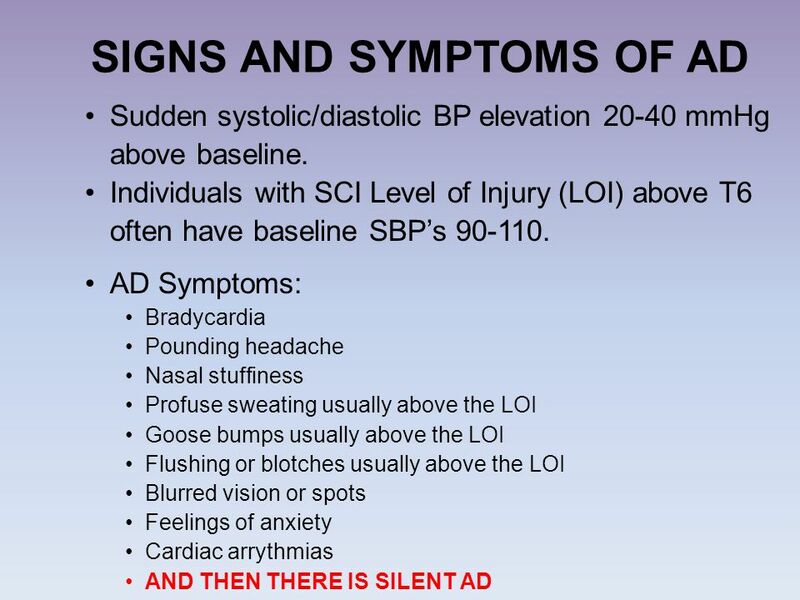 If the nurse calls you to report all the usual interventions have been tried and BP remains high what should you do? 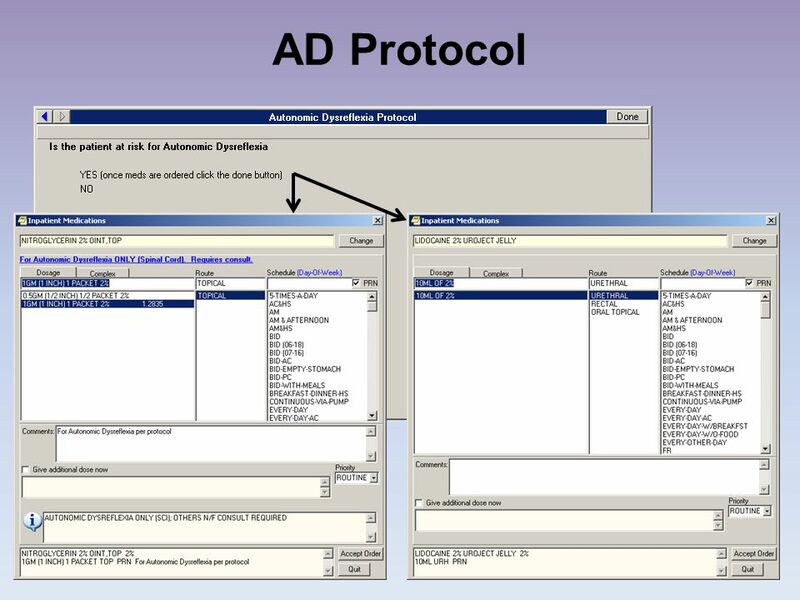 Even when AD appears resolved, it can reoccur quickly. Nurses will continue to monitor BPs every half hour for two hours after AD ends. 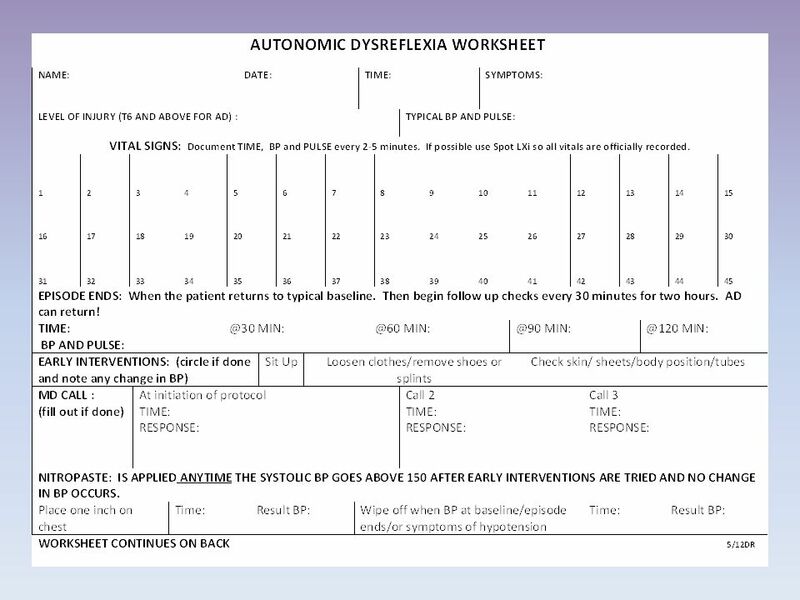 Nurses will put official AD documentation related to their utilization of the protocol in a CPRS Nursing Treatment Note using an Autonomic Dysreflexia template. 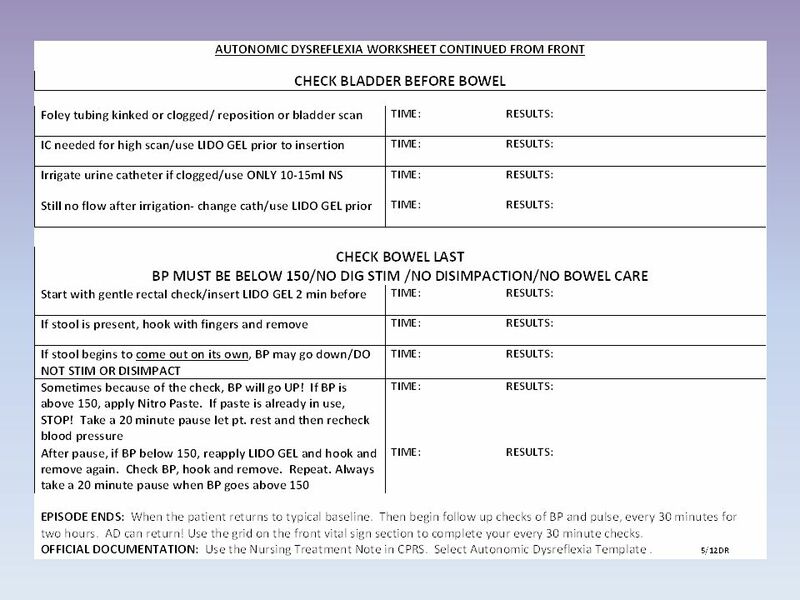 At the bedside, the nurses use a worksheet that can guide you, also! 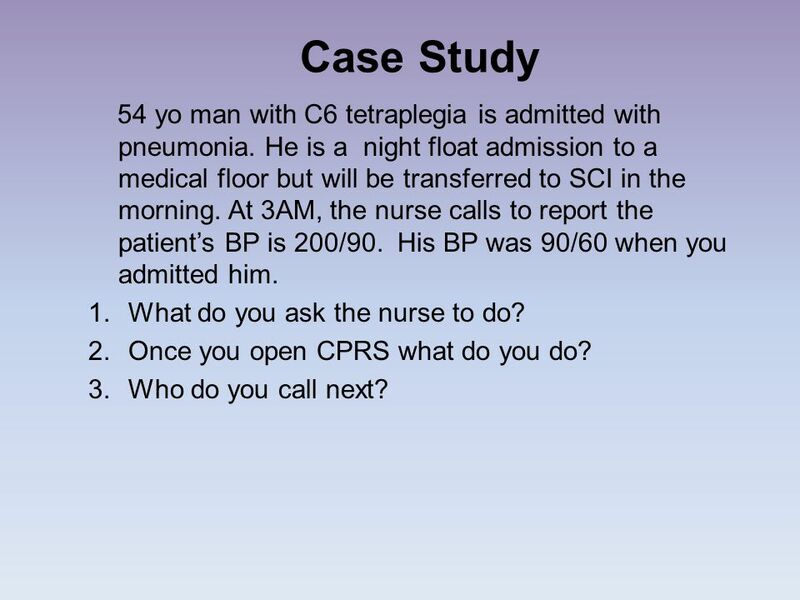 30 Case Study 54 yo man with C6 tetraplegia is admitted with pneumonia. He is a night float admission to a medical floor but will be transferred to SCI in the morning. 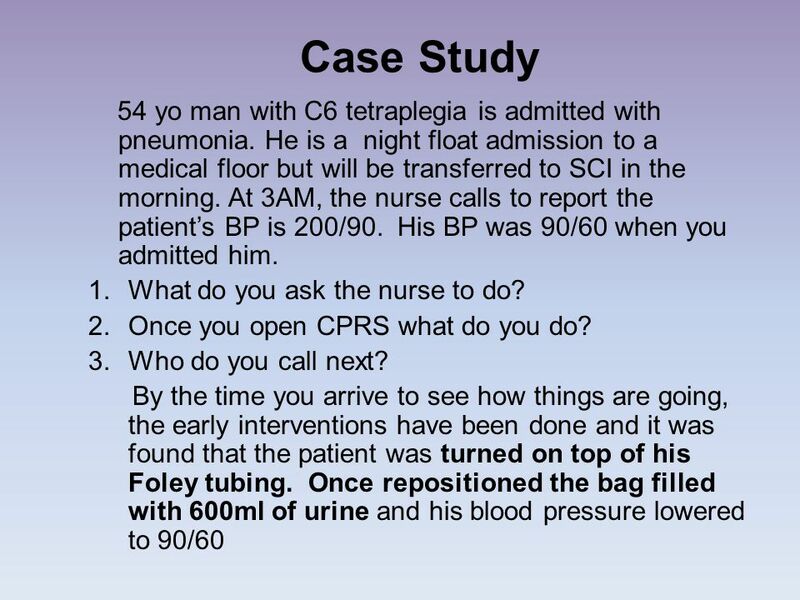 At 3AM, the nurse calls to report the patient’s BP is 200/90. His BP was 90/60 when you admitted him. What do you ask the nurse to do? Once you open CPRS what do you do? Who do you call next? The main respiratory muscles are the diaphragm, intercostals and abdominals. 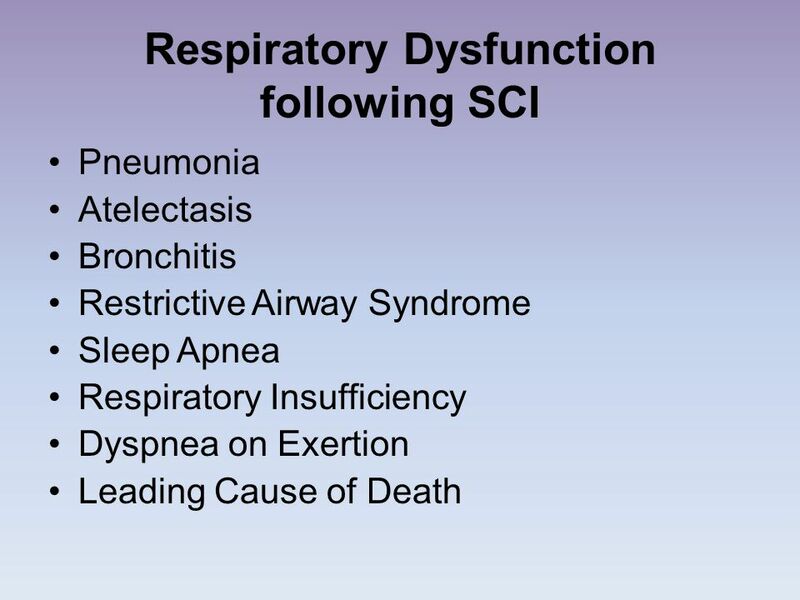 C1-2 SCI: diaphragm is paralyzed and ventilator is required to sustain life. 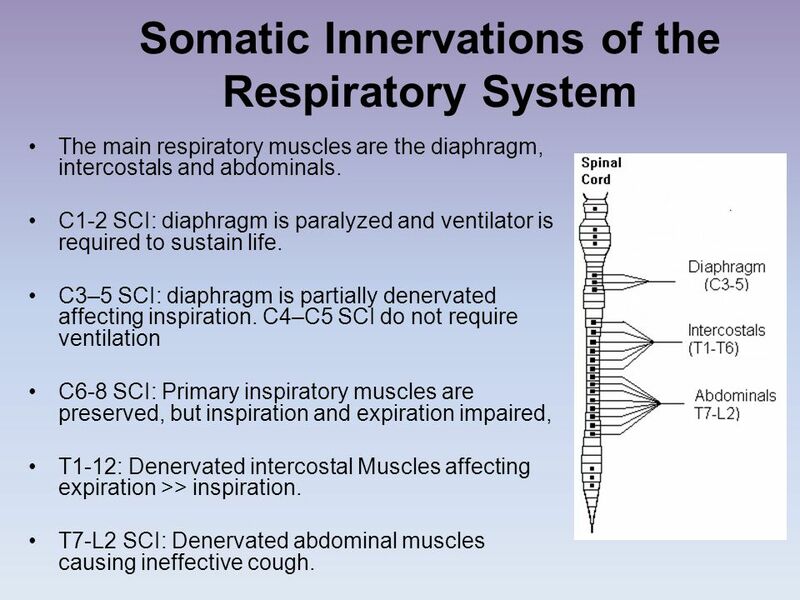 C3–5 SCI: diaphragm is partially denervated affecting inspiration. 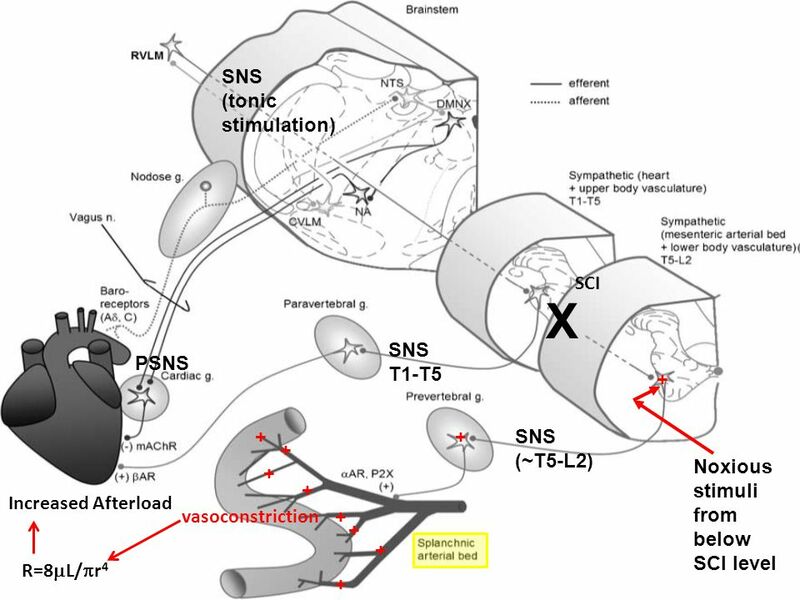 C4–C5 SCI do not require ventilation C6-8 SCI: Primary inspiratory muscles are preserved, but inspiration and expiration impaired, T1-12: Denervated intercostal Muscles affecting expiration >> inspiration. T7-L2 SCI: Denervated abdominal muscles causing ineffective cough. 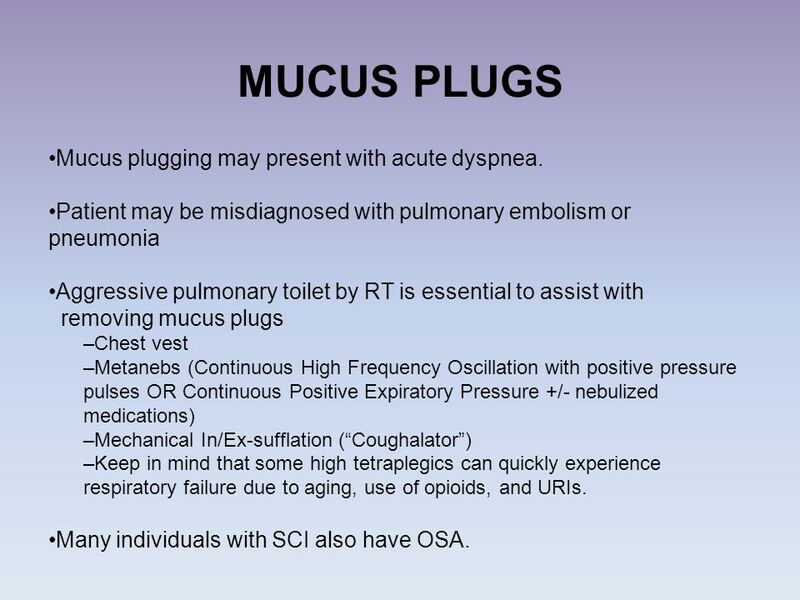 34 MUCUS PLUGS Mucus plugging may present with acute dyspnea. Patient may be misdiagnosed with pulmonary embolism or pneumonia Aggressive pulmonary toilet by RT is essential to assist with removing mucus plugs Chest vest Metanebs (Continuous High Frequency Oscillation with positive pressure pulses OR Continuous Positive Expiratory Pressure +/- nebulized medications) Mechanical In/Ex-sufflation (“Coughalator”) Keep in mind that some high tetraplegics can quickly experience respiratory failure due to aging, use of opioids, and URIs. 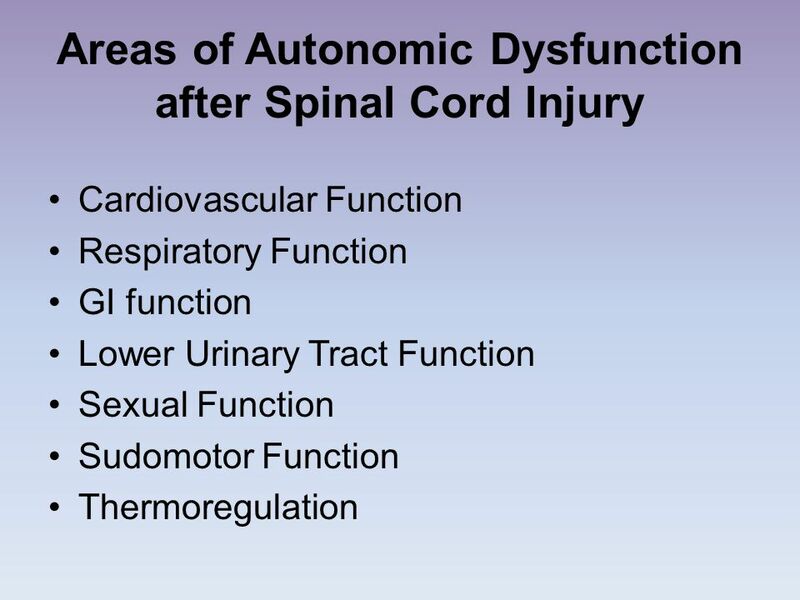 Many individuals with SCI also have OSA. 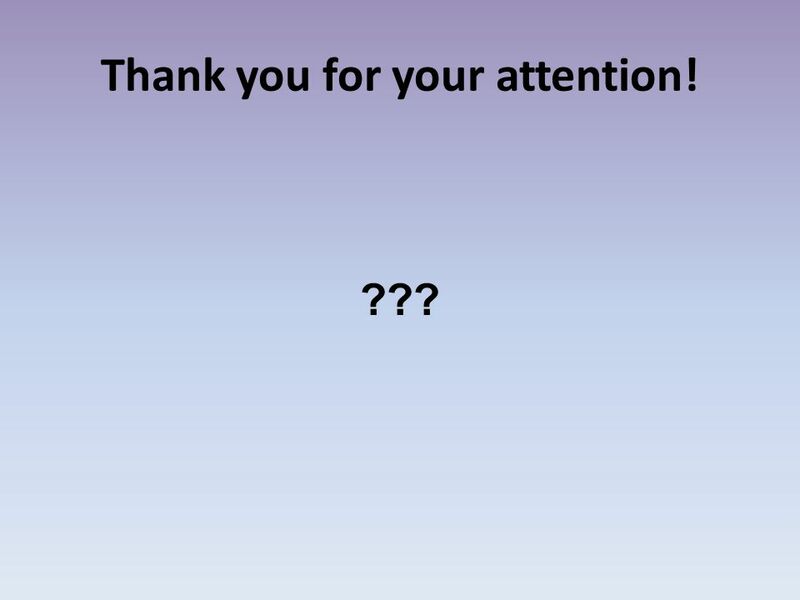 35 Thank you for your attention! 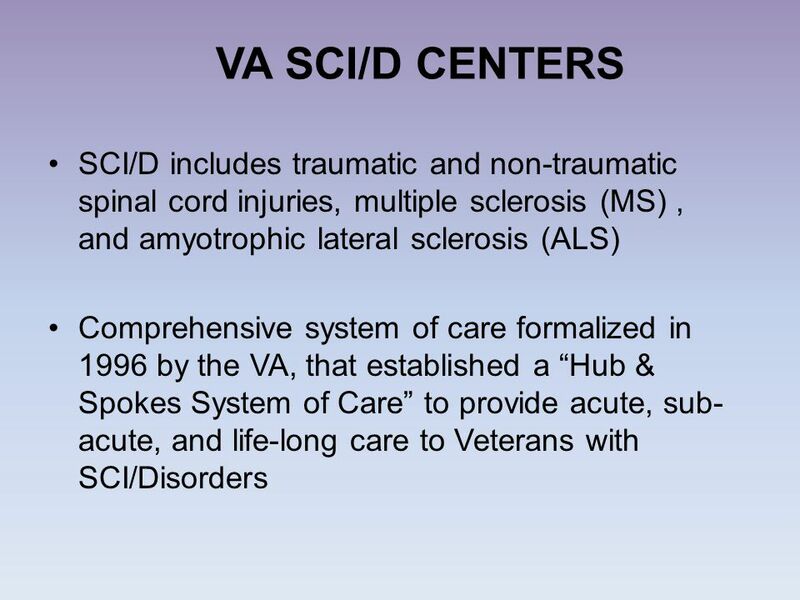 Download ppt "Spinal Cord Injury & Disorders (SCI/D) Service"
What Every Tech Should Know About Blood Pressure? Compression 1. Effects of External Compression Improved Venous and Lymphatic Circulation Limits the Shape and Size of Tissue 2. 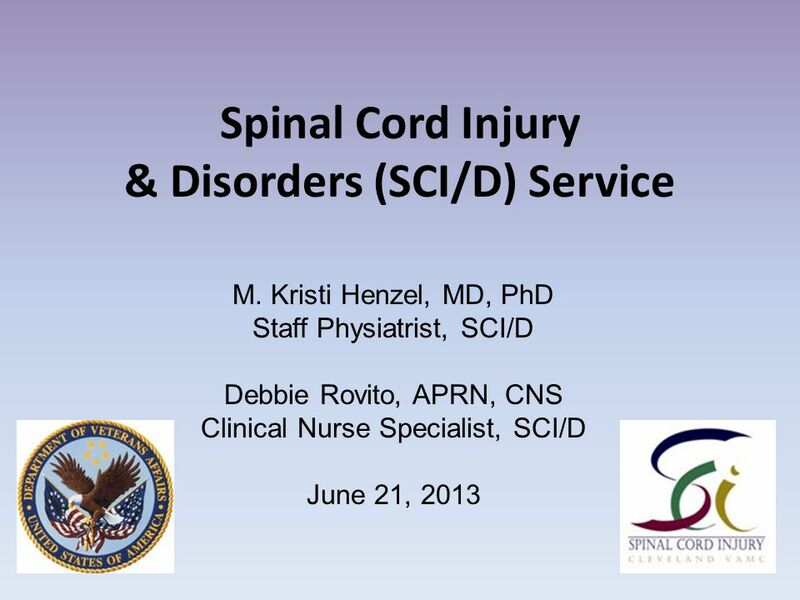 Spinal Cord Disorder Michael H. Wilhelm, CRNA, APRN. 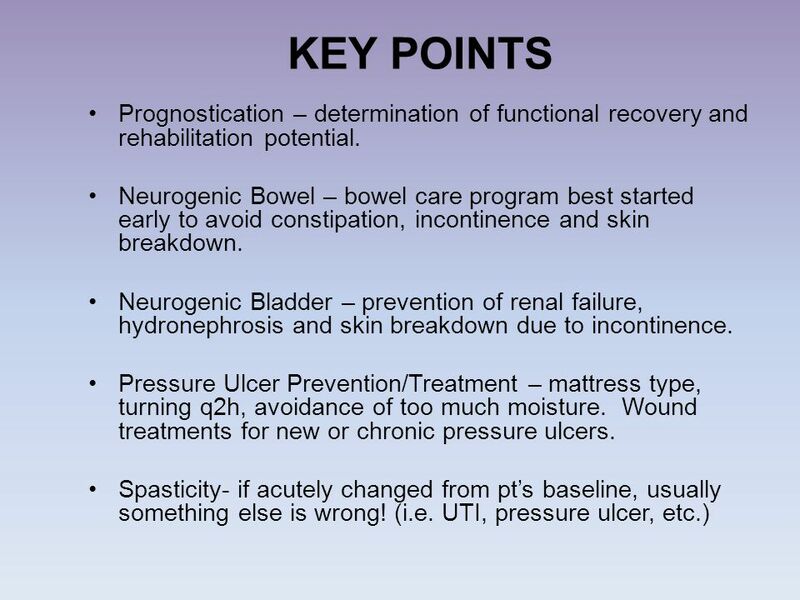 Urinary Incontinence 1 / 18 Fletcher T. Penney, MD Medical University of South Carolina Department of Medicine. OUR LADY OF LOURDES MEMORIAL HOSPITAL Binghamton, New York Medical Emergency Team MET A Strategy to Reduce Morbidity and Mortality. CAUTI: Reversing the Trend. Why the focus? CAUTI is the most common kind of HAI Increases length of stay 2-4 days Attributed to 13,000 deaths annually. 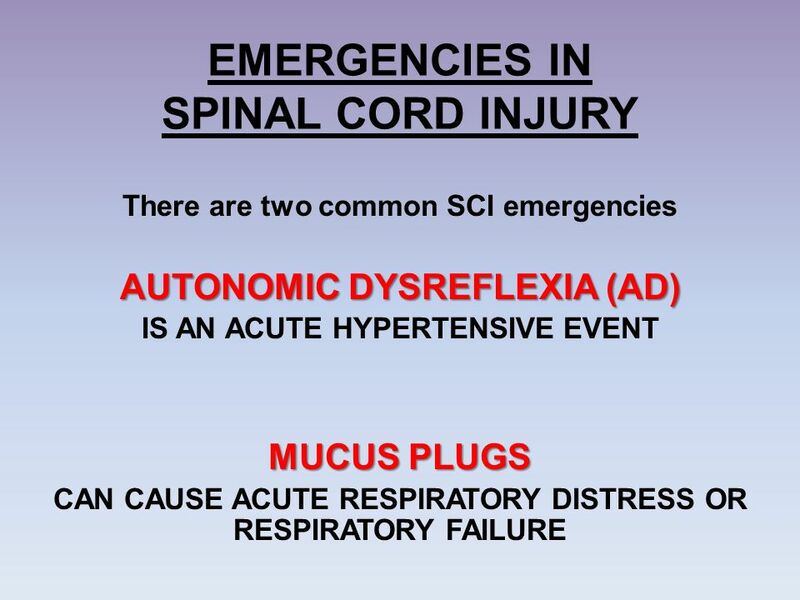 Sickle Cell Disease: Core Concepts for the Emergency Physician and Nurse Acute Chest Syndrome Spring 2013. T HE R OLE OF PM&R IN P ROVIDING Q UALITY H EALTHCARE U N D E R S T A N D I N G Physical Medicine and Rehabilitation (PM&R) Oakwood. Triage Categories for Accident and Medical Practice PROPOSED AMPA TRIAGE SYSTEM A suggested triage scale of three levels relevant to community based facilities. 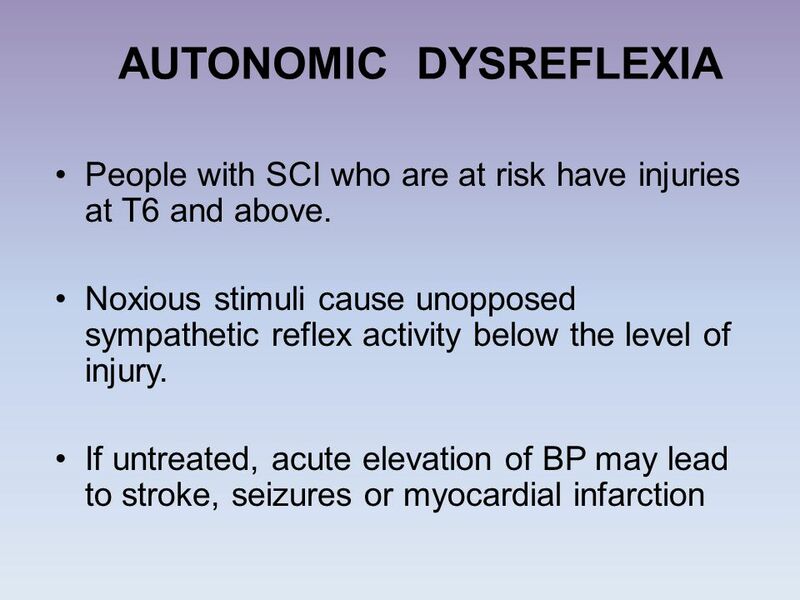 MANAGEMENT OF NEUROLOGIC DISORDERS. What is Traumatic Brain Injury? Closed – head collides with another object but there is no opening through the skull. 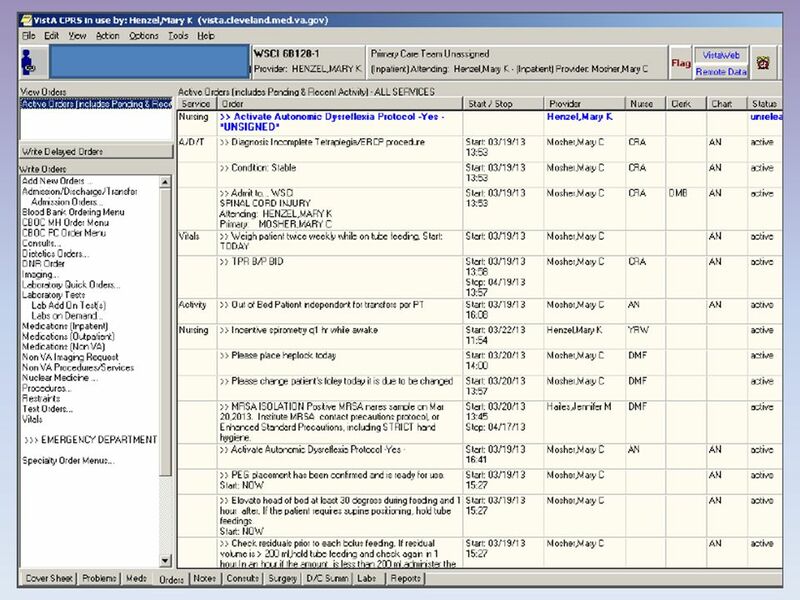 Early Detection of Hospitalized Patients with Previously Diagnosed Obstructive Sleep Apnea Using Computer Decision Support Alerts R. Scott Evans, Vrena.